The next time you break out Grandma's recipe file, amaze your family with beautiful latticework on pie crusts and professional-style ruffled edges on pasta and pastries. It's quick and easy with the Topenca Dual-Wheel Pastry Ravioli Cutter. The Topenca Pastry Cutter uses stainless steel and polished aluminum to produce this lightweight, versatile and non-corrosive kitchen accessory. Just 9" in length and weighing less than 3 ounces, you will have extraordinary maneuverability while cutting ravioli, pizza and farfalle pasta. The ergonomic handle with non-slip finger pads delivers control and reduces hand fatigue during use. To protect your fingers and thumb, a stainless steel cross guard separates the handle from the cutting wheels. Choose from 2 easy-rolling wheels for decorative edges or clean, straight edges on dough, gum paste and more. Your pastry cutter can go right into the dishwasher when you are done. It will emerge in perfect condition, and ready to be hung up by the integrated loop on the handle, or stored in a shallow kitchen drawer. Each Topenca Pastry Ravioli Cutter is covered by a 30-day Satisfaction Guarantee. If your family is not awestruck by the beautiful homemade desserts and pastas emanating from your kitchen, return your Pastry Cutter for a full refund within 30 days of the date of purchase. To bring the authentic look of Grandma's homemade pastries and pastas to your family table, add the Topenca Pastry Ravioli Pizza Cutter to your cart today. TRANSFORM YOUR KITCHEN into a master bakery with this one handy kitchen utensil. 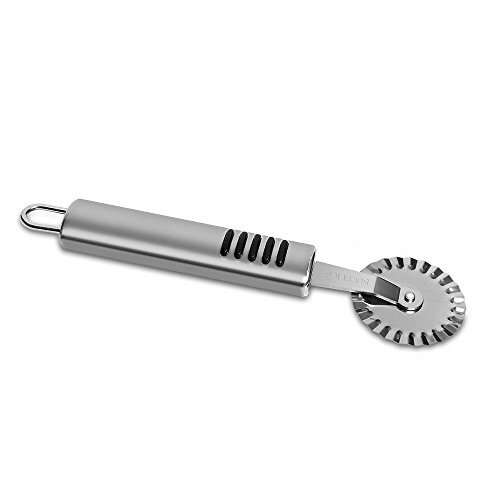 The Topenca Pastry Ravioli Cutter. Slice through fondant, create decorative filled pastas and cut pizza like a pro. MULTI-FUNCTIONALITY from 2 razor-sharp cutting wheels. Make smooth, clean lines with the straight wheel. For commercial-grade latticework on pie crusts or decorative raviolis, use the scalloped wheel. STAINLESS STEEL CONSTRUCTION with an aluminum handle makes our sharpener rustproof and lightweight for optimal control. Easy rolling axles ensure smooth cutting. Cleans easily in your dishwasher. COMFORTABLE ERGONOMIC HANDLE is made of polished aluminum. Non-slip finger pads reduce hand fatigue and maximize control. A stainless steel cross guard protects your fingers from the cutting wheels. 30-DAY SATISFACTION GUARANTEE lets you try our Pastry Ravioli Cutter risk-free. If our product does not perform to your expectations, we will refund 100% of your purchase price, no questions asked.